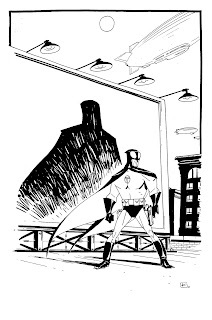 awesome pulp style hero Black Beetle. My version is from Black Beetle the animated series. finds out about this super-cool character. *To see the sketch that made me go "cartoony", CLICK HERE. *Big ups to Nathan Fairbairn as well! Blimps! I'd watch this show in a heartbeat! Ah that's class man! Love the exaggerated build and the shadow on the bilboard. Love both versions. Bring on the comic and animated series NOW! This is great, Andy! It's one of those deceptively simple drawings that has everything it needs to succeed and no more. The colors are just the cherry on top. Hope you don't mind! 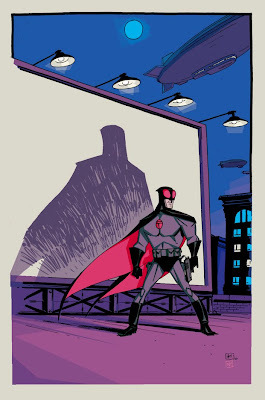 Nathan; great colour choice, and i love all the cut-shapes for the light sources. Great stylization. I love this and the colored version. I really love the sense of space in this pic. What a cool, fun character. I love the inks on this one, Andy. Damned slick, and a great take on Francesco's design. And Nathan, fantastic colors man. Great, unique choices throughout. Andy, Nathan, You guys sold me! I'll sned in my dough right now for The Black Beetle: The complete Animated Series on DVD.